Okay, it’s technically not Monday, but this has been a busy week. We are concluding our look back at X-Men Origins: Wolverine, the fourth film in the series. I have noted in the past, about films like Superman III and even X-Men: The Last Stand, that they don’t necessarily start out bad. For its first half, Superman III is a weak, but serviceable comedy with some good superhero special effects and a charming romance between Clark Kent and Lana Lang. It turns bad about halfway through and never recovers. X-Men: The Last Stand has a weak script with too many plots fighting for screen time, but it also presents some interesting ethical dilemmas in its first half. XO: Wolverine starts with that ludicrous image of the boy roaring at the ceiling, and though it presents some intriguing action moments, there’s never a real story. Worse, like its predecessor, it fills up with characters whose names we barely learn, who are supposed to be characters from the comics. If you don’t come into the movie already a fan of the comics, the movie never gives you a reason to be interested in them. Most of their superhero names are never even spoken; you never hear the words Wraith, Cyclops, Sabertooth, Silver Fox. But even though the movie doesn’t start out good, it still manages to get worse halfway through. So let’s begin our descent into the spiral of stupidity. When we left off, Logan–driven by the need to get revenge on half-brother Victor for the death of his girlfriend–had submitted to a procedure by Colonel William Stryker to fuse his bones with the indestructible alloy adamantium. The procedure was a success. But then Logan heard Stryker plotting to erase his memory, so he broke free and escaped, jumping naked off a waterfall into Alkali Lake. Stryker sends Agent Zero after Logan. Later, an elderly farm couple are tooling down the road when they spot a naked fellow by the side of the road. The elderly couple take Logan in, give him clothes (their dead son’s) and a meal and a place to sleep. And in return, Logan slashes up their bathroom with these. The claws have always been problematic in the series. There are occasional scenes where the CG claws extending from his fist don’t look real. But for some reason, in this scene, they’ve inserted CGI claws into this shot that really didn’t need them; they could have used a practical prop which wouldn’t have looked nearly this cartoony. You really have to see them in motion to get how bad and distracting this shot is. The next morning, Logan is preparing to leave, when Zero arrives and kills the kindly old couple whose names we never learned. It’s shocking enough in its way, although the effect is diluted by the fact that these two people are entirely too good to be true, taking Logan in without the slightest curiosity about who he is or how he ended up naked in their barn or how he sliced their cast iron bathroom sink in two. Logan has a chase scene/action sequence against Agent Zero in a helicopter, as well as two Humvees, reasonably well put together and featuring Logan learning to use his claws for things like this emergency Bat-turn. But there are two big problems with this scene. Number one, Wolverine never really faces off against Zero, who showed himself to be a formidably tough guy in the previous scene with the team. After he kills the old couple with sniper shots, Zero jumps into the helicopter and orders the soldiers to attack. Which leads to problem number two: the soldiers attack with ordinary bullets, which would have had trouble killing Logan before his upgrade, and that’s only if they managed to hit him, which they never do. So Logan kills them all, and then tells Stryker over the radio that he’s going to hunt down Victor and then kill Stryker. Which is when one of the scientists on the project mentions to Stryker that only adamantium bullets can pierce Wolverine’s adamantium skull, and he just happens to have a revolver with six adamantium cartridges ready. Gee, you might have mentioned that before your number-one ace, freakily-accurate mutant sniper got himself de-lifed. This is what they call an idiot plot, boys and girls. Stryker has come up with an adamantium-bonding process he wants to use to create the ultimate super-soldier (we’ll get to him in a bit), but decides to test it first on someone expendable. So he uses Logan, who hates Stryker and everything he stands for, without wondering for even a second if it might not be a bad idea to make his worst enemy into an indestructible murder machine. Because the whole plot depends on it. The plot can only progress because everyone in it is a total moron. Idiot plot: write it down, remember it. Logan then tracks down former teammate John (identified in the credits, but never on-screen, as Wraith) in his quest to find Victor. John (played by will.i.am of the Black-Eyed Peas) says that former teammate Fred Dukes might know where Victor is, but warns Logan that Dukes has put on a little weight since their days together. And of course, since Dukes is the name of The Blob, a little weight is an understatement. They box for the information, and after a little “Boom Boom Pow,” Dukes tells Logan that Victor is probably with Stryker on the island. The two work together hunting down mutants, taking them to the island and doing experiments on them. And at just that moment, more or less, Victor is doing just that, hunting down a young mutant high schooler named Bart, er Scott Summers. There’s a chase between Scott and Victor’s digital stunt double leaping jerkily down the halls. Scott is tackled, his glasses get knocked off, and we get a pretty impressive Cyclops moment, just before he’s captured. Meanwhile, Dukes is telling Logan that he doesn’t know where the island is, but there was one cat who escaped: a guy they called Gambit. So Logan and John head to New Orleans, where they find Gambit in a casino. You would think that a movie which included both John Carter and Dejah Thoris would be better than this, wouldn’t you? Logan approaches Gambit and does a very bad job of coaxing information from him, while outside, John gets into a fight with Victor. And once again, this movie starts wasting my time. Dramatically it’s a waste of everyone’s time. Because not only does the audience know that John’s attacks are useless, they know that John knows. Which means that the filmmakers are lazily checking the box marked “Sabretooth kills Wraith” without putting even a second’s thought into making this an interesting or exciting scene on its own merits. And that statement applies to pretty much the entire second half of the film! At just the moment that Victor is extracting John’s DNA, Logan gets blown out the back wall of the casino by Gambit’s exploding card trick. So now Victor and Logan get into a fight, which is broken up by Gambit, because get this, Gambit–who is desperate not to go back to the island–instead of running away, attacks Logan, then jumps around a little, and then tries to run away. Which once again makes no damn sense, but had to happen to allow Victor to escape and make sure Logan could grab Gambit to take him to the island. Turns out, the super-secret mutant base is on Three-Mile Island in Pennsylvania. Gambit flies Logan there in a little two-seater plane, and Logan jumps out once he’s close. Of course, we’ve already been shown how much heavier Logan is with metal bones, which means Logan will have to walk his way to the island along the riverbed, which brings up the question: Logan can regenerate wounds, but can he drown? Or say, not die, but pass out indefinitely from lack of oxygen? Doesn’t matter, because next thing we know, he’s magically on the island, where Stryker is preparing the next step in his mutant program: a mutant designated Weapon 11 (Logan was Weapon X, or 10). And Stryker has one more surprise for Logan: Kayla’s not dead. In the seriously stupidest twist in this stupid, stupid movie, Kayla was merely drugged to simulate death and splashed with blood rather than killed by Sabretooth’s claws, which you’d think veteran-of-multiple-wars Logan might have noticed. But instead of attempting some last ditch first aid, or calling in authorities and making arrangements for burial or any of that, he apparently just screamed and left her body to rot by the side of the road and never noticed she had no actual wounds. This kind of thing happens in movies all the time, the idea that a character sort of ceases to exist in the time between one scene ending and the next beginning, so they never notice the obvious thing that they certainly would have were they given more than three seconds of screen time to examine. But this is as bad an example as I have ever seen in my 50 years. So Logan breaks up with Kayla and leaves, and then Victor shows up, demanding that Stryker give him the same adamantium treatment Logan got. But Stryker says Victor wouldn’t survive it, so Victor attacks Kayla which brings Logan back in another ridiculous “angry” pose. Seriously, I like Jackman, but there were so many better ways to make Wolverine’s “berserker rage” play on screen. It’s such a wasted opportunity. You want to see a real berserker rage that makes the character suddenly a little scary? Watch Ed Norton beat the crap out of that pretty blond guy in Fight Club. That’s what this movie needed. So Logan and Victor have their big final fight, which doesn’t last very long. With Wolverine’s new enhancements, Victor is no match for him. Logan has Victor pinned to the ground, waiting for the death blow, when Kayla stops him, telling him he’s not an animal. and I get that they’ve been trying to make that a theme over the whole film, but it’s so ham-fisted that it has no impact. Anyway, Logan gives Victor an adamnatium knock-out punch, then he and Kayla go to free the young mutants held prisoner while Stryker orders the not-quite-finished Weapon 11 to be activated. And we get another of these Easter Egg scenes which were cool in the first couple of movies, but in the latter pair have basically substituted for dramatic coherence. In the holding cells, we find Cyclops and Banshee and Quicksilver and a teenage Toad and Kayla’s sister, the White Queen, not named Emma Frost (actually not named at all, per usual). Wolverine cuts open their cells and they all attempt to escape, but their way is blocked by Deadpool, who turns out to be loudmouth Wade, Logan’s former teammate. He actually looks pretty badass with no mouth and those sword blades extending from his hands. I guess there were fans who were upset by this movie’s portrayal of Deadpool and Gambit, but I had pretty much stopped reading the X-line by the time they were introduced, so I know nothing about them except that I hated Gambit’s faux-Creole accent on the 90’s cartoon. So Wolverine sends the kids and Kayla to find another exit while he stays to fight Deadpool, and they seem pretty evenly matched. Deadpool’s blades are a match for Logan’s and he has the same healing ability, so this could be a pretty long fight. Kayla and the kids, meanwhile, run into some armed guards on their way, but with a bit of teamwork between the diamond-skinned White Queen and a blindfolded Cyclops, the guards are taken care of. Kayla tells her sister to lead the kids to safety while she stays behind to see to Logan. Once the kids are gone, we realize Kayla has suffered a bullet wound in her gut. Now the two brothers fight back to back as Deadpool attacks them with incredible speed, teleporting in and out between attacks. But finally Victor gets hold of him and Logan stabs him, before Deadpool knocks them down and teleports to the other side of the tower. 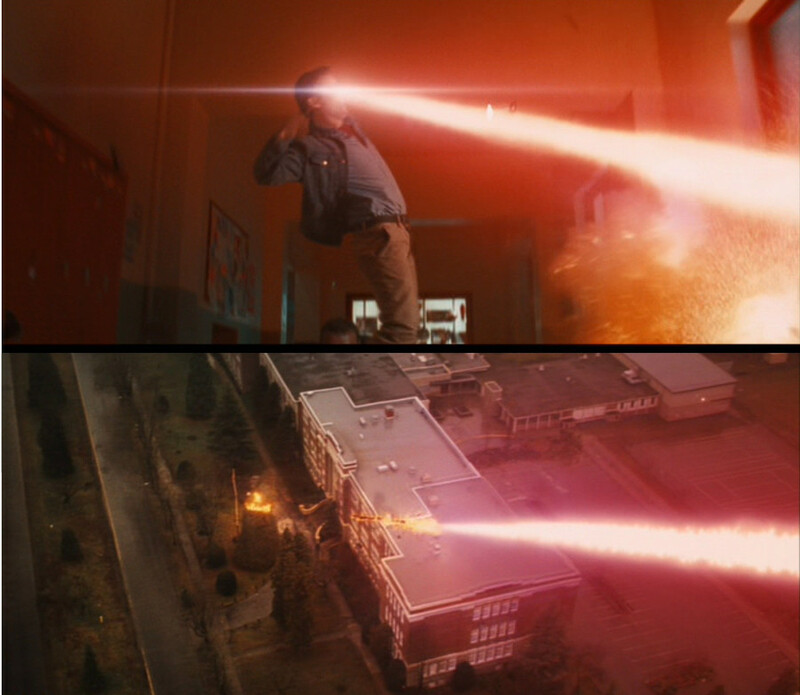 Where he unleashes his final weapon: Cyclops’s eyebeams. He blasts Logan, who blocks the beams with his claws (?) while Victor runs around and tackles him. Deadpool pins Victor to the ground and blasts him into it, which is when Logan uses his now red-hot claws to cut Deadpool’s head off. Deadpool falls into the tower, eyebeams still blasting from his severed head. Okay, that is ludicrously over the top, which is exactly what makes it pretty cool. Victor declares their business is not over and runs away, and Logan discovers a wounded Kayla. Before he can get her to the hospital, Stryker appears and shoots him with the adamantium pistol. As Wolverine charges him, Stryker puts two bullets into his forehead. And what happens next is not a surprise, both because we know from the later movies that he lost his memory, and because we’ve been told a few scenes ago that the bullets will not kill him, but make him lose his memory. Meanwhile, the kids have been running through secret tunnels, following the directions of blindfolded Scott who is getting weird messages in his brain. And when they come out the other end, they find a helicopter and a kindly bald man who GYAAAHHH! That’s even worse than the facial smoothing at the beginning of X-Men: The Last Stand. And seriously, why? They managed to recast all the other parts who would recur from the other films: Cyclops, Stryker, Sabretooth, even Toad. Why pull this ridiculous digital stunt at the end of a movie that has already egregiously exceeded its ridiculosity quotient? Oh, well, it’s just the one shot. Wolverine comes to, and Gambit is there to tell him that his name is Logan, just like his dogtags say. And Kayla’s dead body is there, but Logan no longer knows who she is, so he closes her eyes and leaves her there as emergency crews are arriving. And then it’s all over but the post-credit stinger, where Deadpool’s severed head opens its eyes and shushes (with his now functional mouth) the cries of a supposedly astounded and terrified audience. Maybe he’ll be back in the upcoming sequel. And that’s it. Although there are moments of real spectacle, and the effects are mostly okay (excepting Nightmare Fuel Xavier and cartoon claws), the movie is an utter failure on the storytelling level. It completely abandons its storytelling responsibilities, becoming a parade of idiot characters and half-thought-through bad ideas papered over with callbacks to the comics in the hopes of keeping the fanboys happy. Which might have worked, if they hadn’t, you know, changed almost everything from the comics. Next week: back to the 60’s with X-Men: First Class. 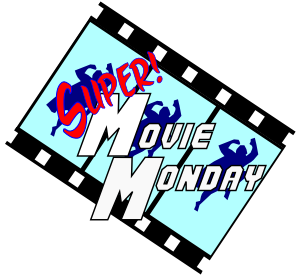 This entry was posted in Super Movie Monday and tagged Movies, superhero, X-Men. Bookmark the permalink.